So, I'm down with this backyard gardening thing. I like it. I really do. But, it's not like I'm feeding the whole family with an abundant yield of amazing produce. I am totally winging it. I have no idea what it means to "tend the garden" and don't do much besides water and pull out dead stuff. 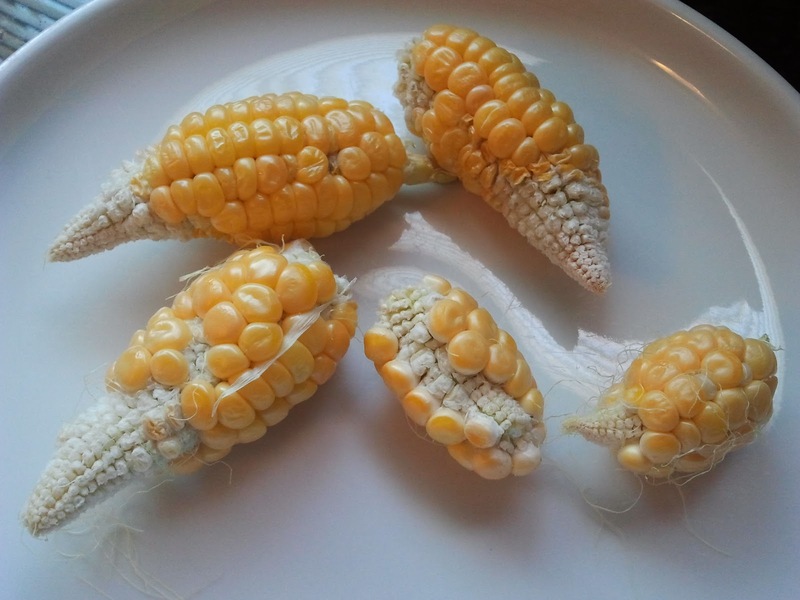 I mean, look at this pathetic corn that I harvested this week. Ummm, ya, not even remotely close to the corn that I buy from the store. I even left one out for the birds and backyard squirrels and I've yet to get a nibble. Anything edible that my garden does produce is like a joyous celebration of triumph. And fresh always tastes damn good! That's why I just love love love my blueberry bushes. They produce tons of blueberries and we do nothing but eat, eat, eat away. And this year, getting that BEYOND BELIEF AMAZING blueberry bush from my neighbor has only intensified my love for them. Between the two bushes I now have in my garden, we literally get at least a dozen ripe blueberries a day. Not only are we saving boat loads of money, but they taste waaaaaaaaaaaay better than the store bought ones plus without any use of chemicals. Absolutely heavenly. The other day my fabulously wonderful funny, smart, and beyond charming handsome husband goes to Costco just to fill up his truck with their inexpensive gas and then spends $200 including...GASP!!!!!!!!!!!!!!!! !...a mega carton of blueberries. BLUEBERRIES from the store! I want to say I shrug my shoulders and smile with a little giggle as I affectionately think “oh how cute of him!! This sweet guy went shopping is so healthy and thinking of us and wanting to do good for our family and (hee hee hee) just innocently forgot about our homegrown blueberries”. But…honestly, I shake my head and mutter a few colorful explicatives and think “DUH! He just spent all this money on blueberries when we consistenly pick them EVERY DAY from our OWN GARDEN by the handfuls and I wish he paid more attention and URGH how annoying because it’s practically discounting all of my effort to homegrow these and…well…how grrr!!!”. Sooo, what do I do as an outlet when I’m annoyed? I bake. And, in this particular case, I make pie. I dump the non-homegrown contraband Costco blueberries into a saucepan and add a generous squirt of blue agave sweetener, a bit of vanilla, cinnamon, salt, lemon juice, and some corn starch to thicken. While it’s cooking I make the crust by the 3-2-1 method – 1 cup of flour, ½ cup of unsalted butter, ¼ cup of water, and a dash of salt. The rolled out crust gets pressed into the pie dish, topped with a diced apple tossed with sugar and cinnamon. Once the blueberry mixture is thickened, I pour it over the top of the apples and bake in the oven until it looks set and the crust is golden brown. The baked pie cools on the counter, then goes in the fridge for the next night’s dessert. Pie almost always tastes even better the next day. And, wouldn’t you know it, that pie is really good. I’m talking AMAZING. Epically awesome . Top three pies, if not the best pie I’ve ever made. It’s sweet but not too sweet, flavorful but not overpowering, set perfectly without being runny, the crust is simple and flaky, and the texture is smooth and balanced with a tiny bit of crunch from the apples. I get a big thumbs way up from my adoring admirers as they gobble up every last crumb. Victory! The blueberries are redeemed. When I make this pie again, I will call it my "Happymiss blueberry-apple pie". Just to think, there I was, all frustrated that my well-meaning man bought a warehouse sized carton of blueberries, when I turn around and make, without a recipe mind you, one of my best pies ever, if not of all time in the history of blueberry pies! Every bite of that delicious pie washed away any leftover grrrr!! with replaced it with a well deserved and satisfied smile.